Living a Fit and Full Life: Help Your Child Get Ahead in School with Fun Workbooks from Scholastic! Help Your Child Get Ahead in School with Fun Workbooks from Scholastic! This comprehensive collection of teacher-approved activities is designed specifically to meet the educational needs of your 1st grader. More than 300 pages worth of skill-building exercises cover a wide range of topics, including the alphabet, phonics, spelling, handwriting, numbers, shapes, and more! Activities provide unlimited practice in basic reading and math skills and will prepare your child for school success . 300 skill-building pages that give kids practice with vocabulary, reading comprehension, writing, multiplication, fractions, and everything they'll need to succeed as students. For use with Grade 3. 300 skill-building pages that give kids practice with vocabulary, grammar, reading comprehension, writing, multiplication, division, fractions, and everything they'll need to succeed as students. For use with Grade 4. Workbooks are also available in other grade levels! 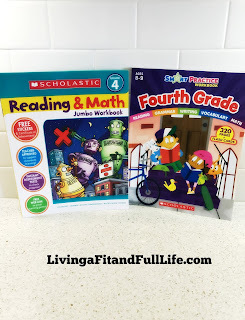 Help your child get ahead in school with fun workbooks from Scholastic! Scholastic has an amazing selection of workbooks for kids and with school back in session, they're the perfect way to help your child get ahead. Scholastic's Smart Practice Workbook is filled with fun practice pages designed to help students master essential skills in reading, writing, vocabulary, math, and more. It includes over 300 pages as well as a set of flashcards for extra skills practice. Scholastic's Smart Practice Workbooks are available from kindergarten to 5th grade are will surely be a fun way to help kids excel this year! Scholastic's Reading and Math Jumbo Workbooks give kids practice with vocabulary, grammar, reading comprehension, writing, multiplication, division, fractions, and everything they'll need to succeed as students. It has 300 skill-building pages that my kids seem to enjoy. Each page is filled with fun new activities and ways for kids to learn. 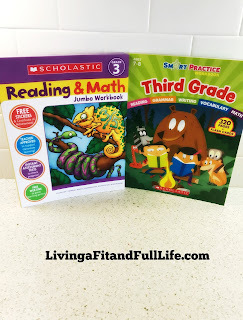 Scholastic's Reading and Math Jumbo Workbooks start as early as pre-k and make learning fun! My kids absolutely love these workbooks and I love that they actually ask to use them, making my job that much easier. 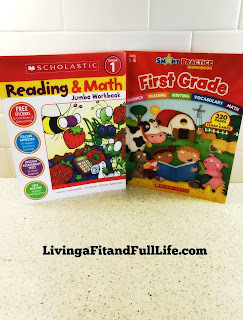 Scholastic's Smart Practice Workbook and Reading and Math Jumbo Workbooks are absolutely amazing and I highly recommend them!